How is life? I won’t beat around the bush today and directly get to the point. I just reviewed a sunscreen here. And I am back again with another sun protection product! 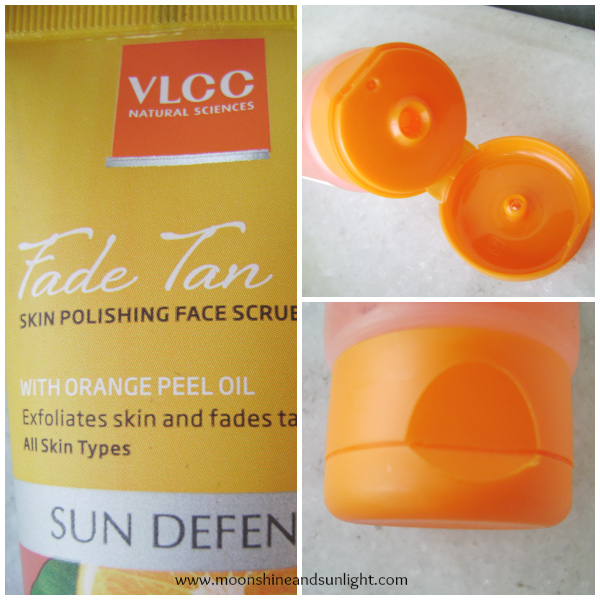 Today I am reviewing a product from VLCC. I bought this a few months back. And I have been using this since. I have an Anti – tan face scrub today. This is my first product from VLCC and I have mixed feelings about it. Let’s see what this product is like. Packaging: - I like the matte tube. It is partly transparent so you can see the product inside. It has an orange flip cap which is very tight and you do not have to think about leakage. Product: - since this is a face scrub the size of the granules matter. The size is okay not too big, not to small in size. I like this because it exfoliates properly. It smells kind of like orange vodka! :P The consistency is gel like and doesn’t foam up. My experience: - I basically like this one as a scrub but when I saw that it has been tested on animals, I felt bad and decided against it :(. I am going to finish this up and not going to buy VLCC products anymore. As far as the anti- tan is concerned, it does not make much of a difference. I have combination skin and I feel fresh after using this. My skin doesn’t feel dry. This claims to be for all skin types. Have you tried this product?? What do you think of the anti-tan scrub?? If you use any, which one do you use ? sounds like a average product! nice review though! Yes , it is an average product ! It is quite average and sadly tested on animals. I do not like the sound of it. If it claims anti-tan then it should be so but it does nothing. I have same skin type as yours so I am skipping it.